Our Fall 2013 trip to Spain started with flying into Madrid. This covers our 3 nights in Madrid before taking a bullet train on to Barcelona. TO GET STARTED, CLICK ON THE FIRST, UPPER LEFT IMAGE, THE ONE WITH PINK WRITING ON BLACK. 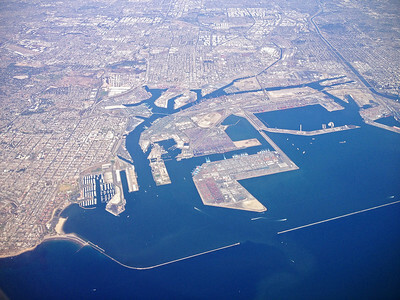 The view from our plane over Los Angeles Harbor, as we depart LAX. Carl's former command, USCG Support Center San Pedro , is the small, vertical rectangle just left and down from the center of this photo. 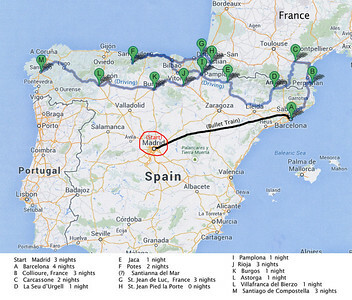 Our trip includes northern Spain and a bit of southern France. It started by flying into Madrid, which is the subject of this gallery. 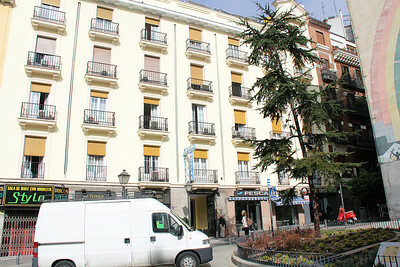 The Hotel Acupulco, in the old town part of Madrid. Our room was on the 4th floor ... the room with the open door. 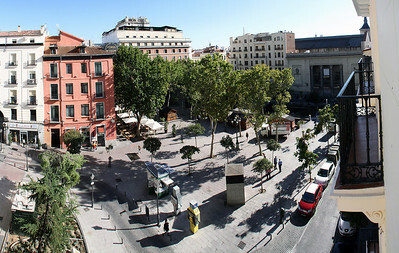 The view from our room out over Plaza Carmen. 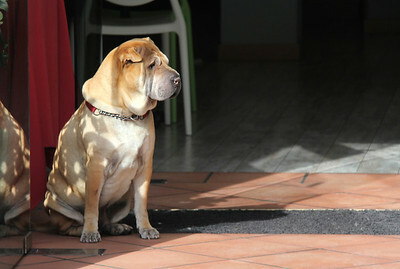 Next to our hotel, this dog stood guard at his owners restaurant. 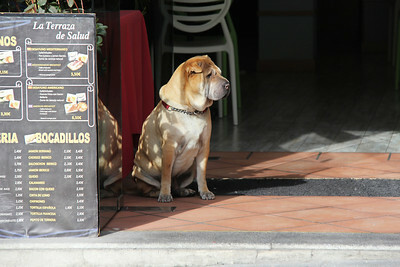 Because his owner's restaurant advertised bocadillos (a simple meat sandwich), I called him Señor Bocadillo. 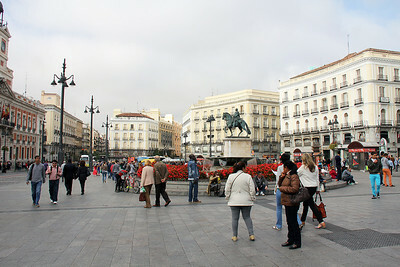 Only about 4 blocks from our hotel was Puerta del Sol, the plaza regarded as the center of Madrid. 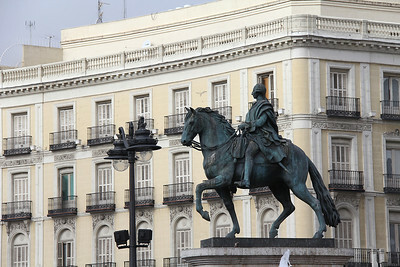 Puerta del Sol ... a statue of Charles III (1716-1788), whose enlightened urban policies earned him the nickname of "the best Mayor of Madrid". A tourist embraces the statue of a bear in Puerta del Sol. The bear has been the symbol of Madrid since medieval times. He eats berries from a Madroño tree which are used to make a local liqueur. 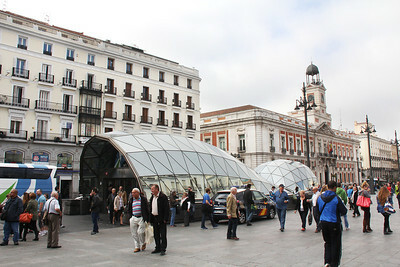 The "glass-fish" entrances to the subway on Puerta del Sol. The county governor's office is the red and white building to the right. 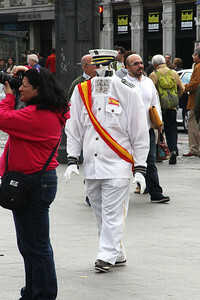 A street performer solicits posing business on the Puera del Sol plaza. 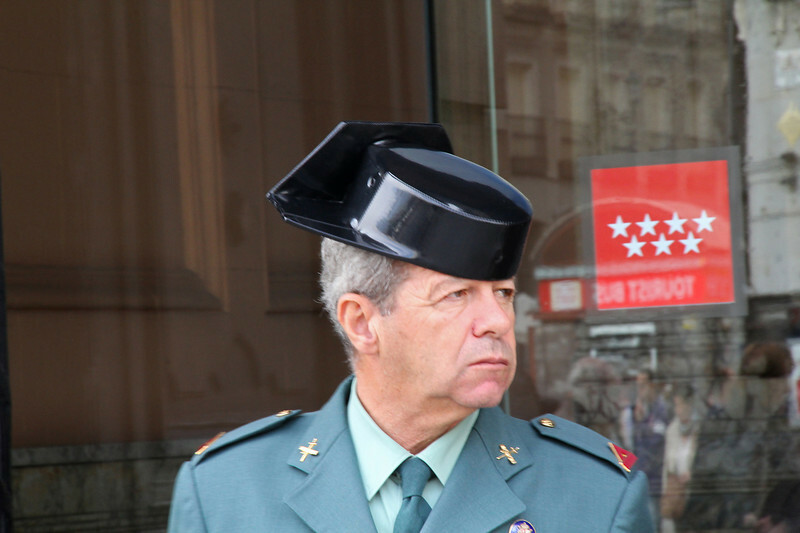 I think he was trying to portray King Juan Carlos. 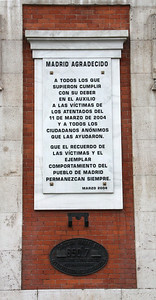 This plaque on the county governor's office on Puerta del Sol celebrates the citizens who helped after the terrorist bombings of March 11, 2004. A civil guardsman at the County Governor's office wears the traditional hat with the square back. It's said the square back is designed so the men can lean against the wall while enjoying a cigarette. 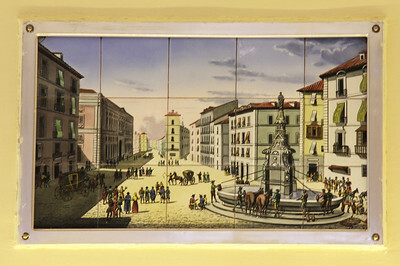 This tile painting in a bakery shop on the Puerta del Sol shows how the plaza looked in the 18th century. 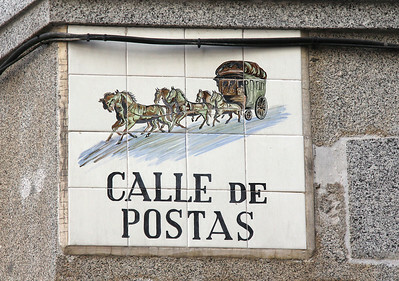 The medieval street signs, this one showing a postal coach, included pictures so the illiterate could "read" them. 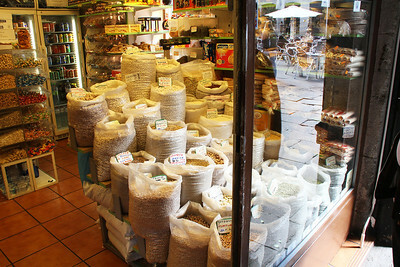 A shop along the Calles de Postas street. Calle de Postas lead us to the Plaza Mayor, the other major plaza in downtown Madrid. A panorama of 9 vertical images side by side to capture much of Plaza Mayor. The white umbrellas in the far corner are in front of "La Torre del Ora Bar Andalú", a "temple" of bull fighting, as will be shown in the next series of photos. The interior of "La Torre del Oro Bar Andalú. ", a "temple" of bull fighting. 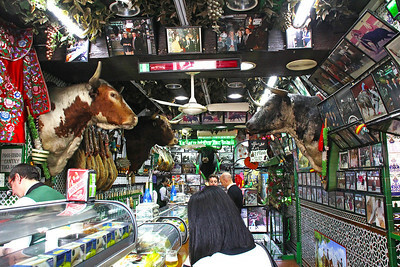 Full of stuffed bull heads and numerous photos from very famous bull fights. 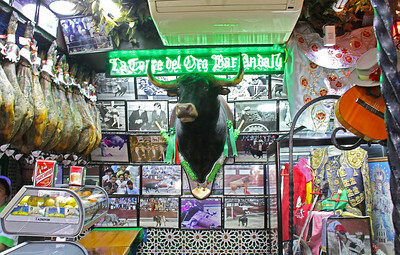 "La Torre del Oro Bar Andalú" is as close as we would come to an actual bull fight.